Always fun to see these ducks. Lots of photos of Justin on mom's back in summer. He got a kick out of the winter scarfs. So cool. I wish I only had to wear a scarf to feel warm!!! Very, very cute! When I saw them, they were surrounded by green grass! Ah, yes. Robert McCloskey. A book I could read over and over again, and did. I suspect it will be one of the first books my daughter puts in the library when it is her turn to have kids. I was born in 1941, the first year McCloskey's Make Way For Ducklings was published. It is one of the first books I remember, both for the story and for McCloskey's wonderful illustrations. I grew up in Oklahoma and visited Boston for the first time in the early 1970s. When my taxi drove by the Boston Public Garden and I saw a Swan Boats in the lagoon I realized with a start that this was a real place and not just an imaginary setting in a book. I went back later and walked through the garden enjoying what seemed like a familiar scene from my childhood. I remember them pictured by you in summer time! They are cute with their little scarfs! I'm wondering who took time to tie every scarf around their necks?! 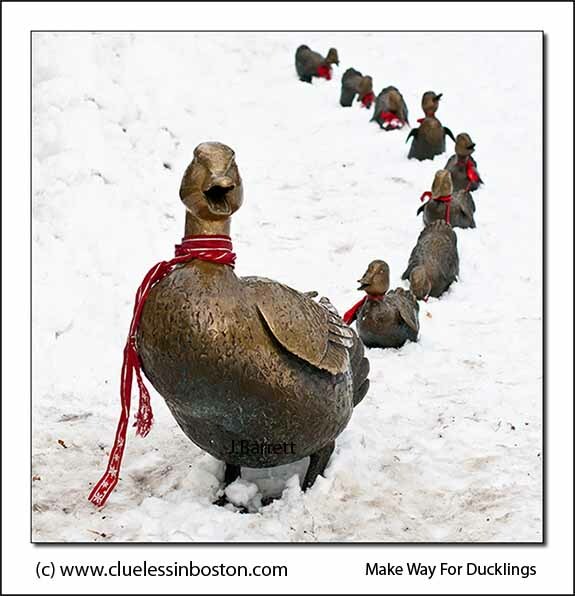 We have a saying about 'brass monkeys' here in the UK; might apply to ducks as well in that weather. My goodness! This is absolutely adorable. The scarves look adorable on them! It is a lovely family. Their love may melt snow.